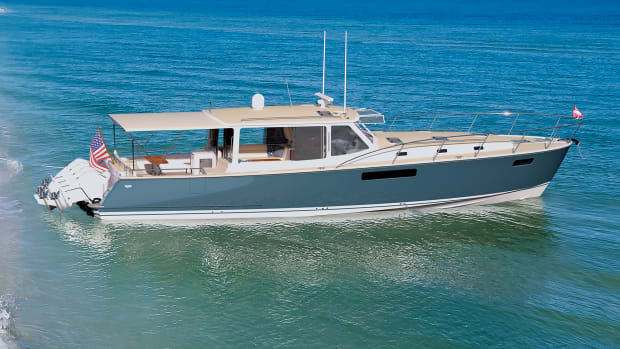 The 35z from MJM ushers in a new era of outboard-powered Down East yachts. Bob Johnstone looks behind him, then forward, and with his right hand toggles the Mercury joystick to the left. The outboards pivot, smoothly, and the MJM 35z slides, again, smoothly, to port. He carries on a conversation while maneuvering the boat through Newport Shipyard. If there’s a more intimidating place to dock in New England I haven’t seen it. Superyachts jut out into the fairway on each side and sailboat crews in RIBs are buzzing about, yet Johnstone seems totally at home here. In a way he is. 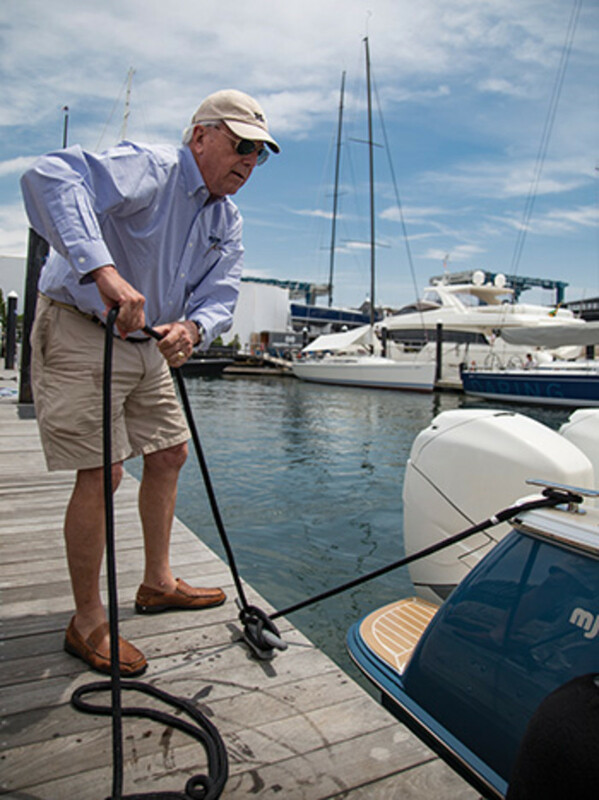 Newport Shipyard has been home base for Johnstone, founder and CEO of MJM Yachts, and for many of his personal MJMs. But this boat, the first outboard-powered MJM in the builder’s stable, has only been under his command for a few weeks. Prior to the 35, he owned and ran the range of MJMs, from the 29, 34, and 36, to the more recent, larger and wildly popular 40z and 50z (the company’s largest offering). 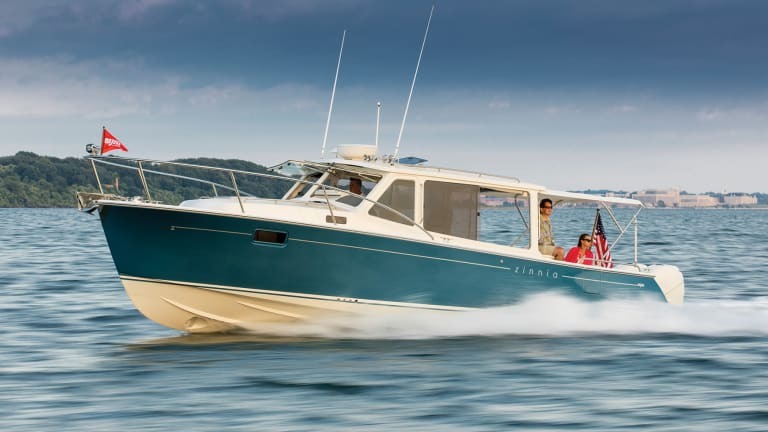 While idling out of the harbor Johnstone Sr. and I continued the conversation about how it seems that more and more traditional center console builders are implementing changes to make their boats more family friendly. And she is luxurious. 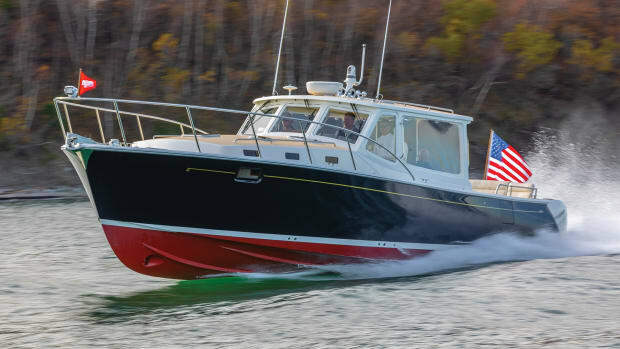 Step down from the helm and you’re in a warm and inviting interior that boasts a similar feel to her sisterships. 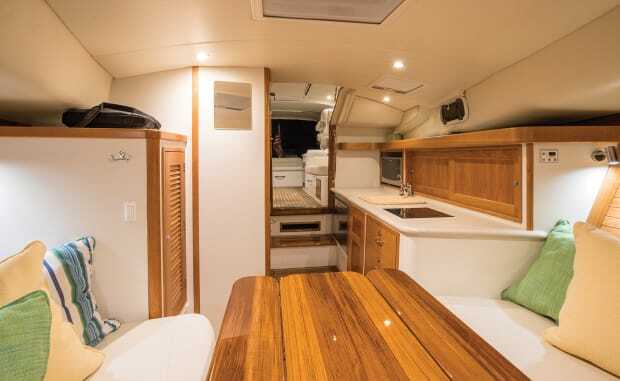 There’s a galley to port with tons of stowage, a comfortably sized head, and a V-berth forward with a teak hi-lo table that looks like a piece of artwork. 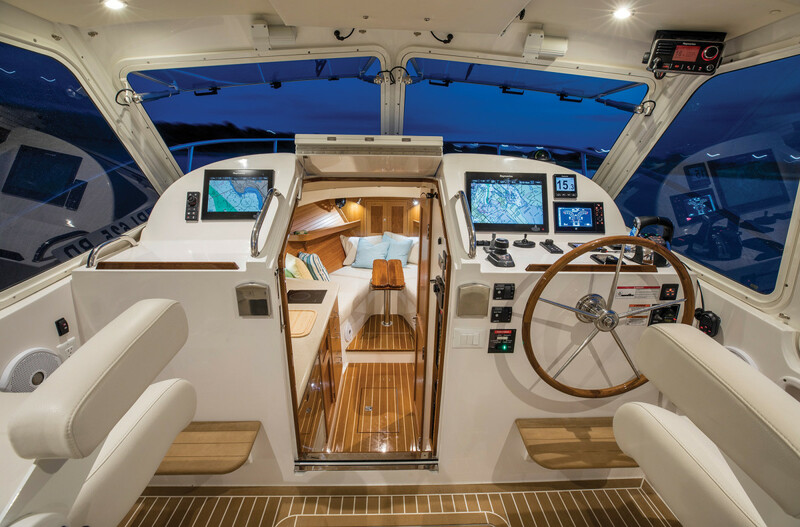 A teak-and-holly sole and teak hull liner give the feeling of being aboard a large, well-lit sailboat, which makes sense considering that Johnstone achieved boatbuilding fame when he and his brother founded J/Boats sailboats. But where the MJM 35z, and indeed all MJMs, stands apart is in the cockpit: It’s one huge continuous space. 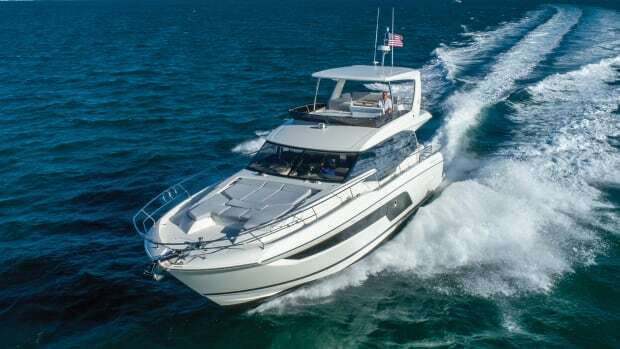 The true “cockpit” has seating for three adults under a bimini top, but the main-deck ‘salon’ and helm area accommodates seven more. 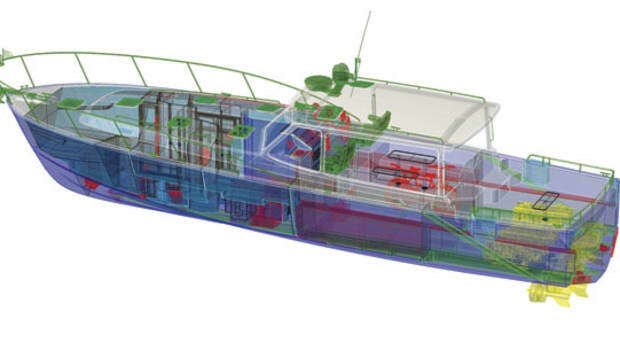 Enormous windows on each side complete the open look and feel of the boat. Should the weather turn snotty, our test 35 had a canvas enclosure aft. 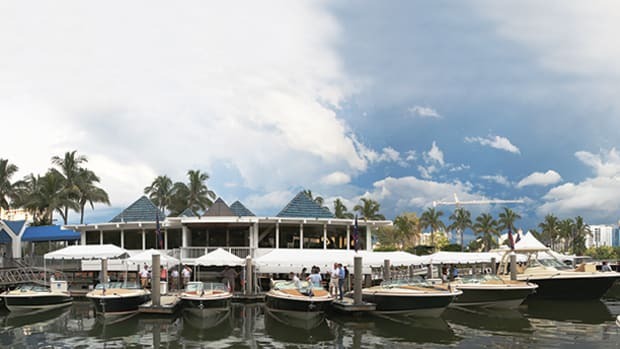 Once clear of the no-wake zone I was able to spur the twin 300-horsepower Mercury Verados and point the boat to open water. The current was running against a stiff breeze, which made for a confused 2- to 4-foot chop. These were ideal conditions for testing the optional Seakeeper 3 beneath the sole between the helm seats. I saw a roll reduction of about 75 percent in a beam sea with the boat in neutral, according to the Seakeeper helm display. As I was recording the results of the Seakeeper, Johnstone took a call. “Excuse me one second,” he said, as he lifted the phone to his ear. “Hey Doug, we’re actually on a sea trial, but how’s it going?” Doug, I would learn, was Doug Zurn of Zurn Yacht Design. The two chatted like old friends. Their close working relationship began with the first MJM, a 34z launched in August 2003. (The ‘z’ in that model’s name, and in the new 35’s, is a tip of the hat to Zurn.) Johnstone filled him in on the successful sea trials he’d had the prior weekend and the orders (more than 20 at the time) that were pouring in. They agreed to talk again later in the day. Looking back at my notes from our test I noticed a single word I jotted down and circled in the margin beside my performance data. Smooth. 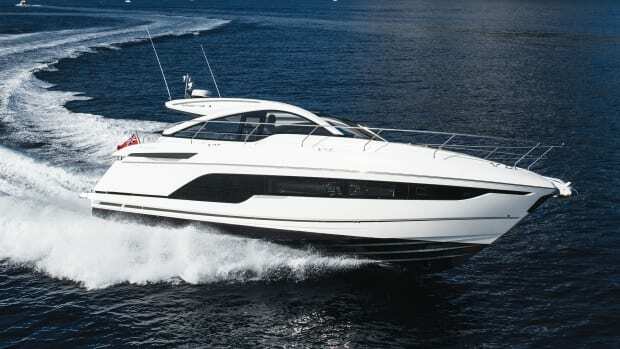 That was my first and last impression of the boat as we ran through the rpm range to 38.4 knots. 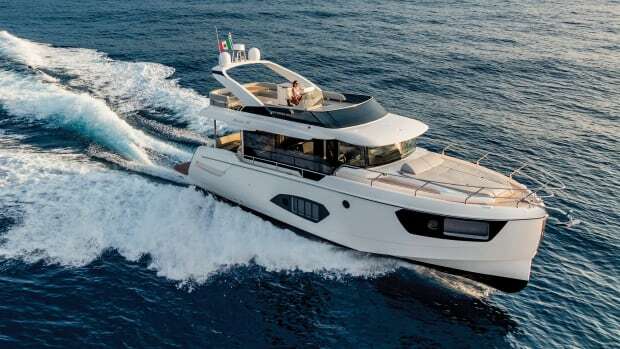 She was responsive at the wheel, yet stable atop her Zurn-designed hull, featuring a modified deep-V shape—19.7 degrees of deadrise at the transom—and svelte length-to-beam ratio of 3.5:1. She tracked like an arrow. I also noted how quickly she hopped onto plane, a characteristic that was aided by an automatic trim tab system from Imtra called Zipwake. After running her at speed we turned back toward the shipyard. The harbor provided a good place to practice using the joystick. 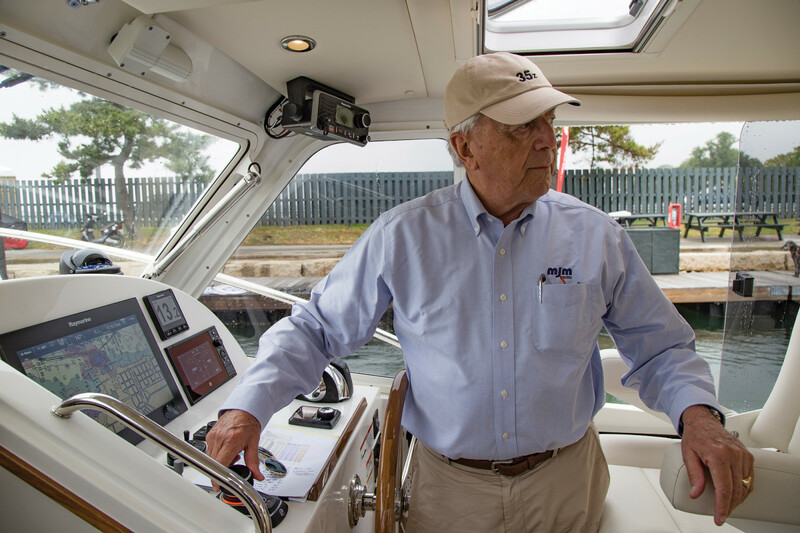 Mercury’s Joystick Piloting felt very intuitive, and when combined with the Skyhook option, “makes the boat great for single-handing,” said Johnstone. Ever a man of his word, he grabbed the helm and as we approached his slip he engaged the Skyhook, coiled his lines neatly, hung the fenders, then tilted the joystick to the right, and the boat slid smoothly, like it had at the start of our trip. I instinctually went to hop off and help with the lines. “No, no, I got it,” he said as he opened the side door and stepped off to secure the lines. I tried to not seem overly impressed. A group of guys walking down the dock did stop and offer a round of applause, which felt right. After tying up we shook hands and went our separate ways. Johnstone had to gear up for another sea trial with a customer that afternoon. 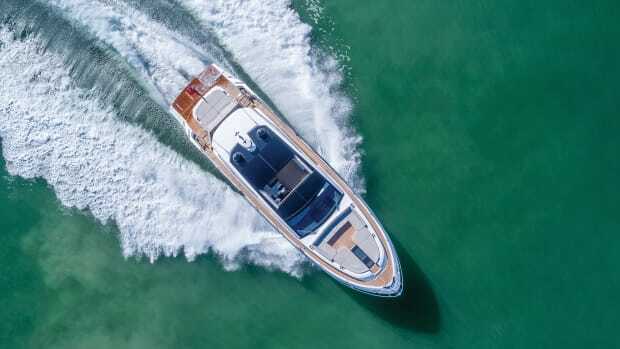 There was no slowing down for Johnstone that day, and it appears he will stay full throttle for some time, especially with news of a new outboard-powered 43z coming on the heels of the 35. He will find time to relax, he says, and enjoy some cruising. In recent years he could be found running his 50z with his wife, Mary, up and down the coast. 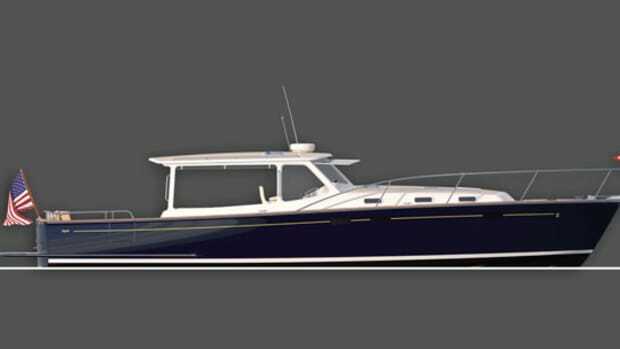 Now, he’ll be cruising Zinnia, the name of his new 35, which is a tribute to his wife, who enjoys the flower of the same name. “So, she’s a gardener?” I asked. Some may wonder, does Bob actually cruise his boats for pleasure or is his “ownership” more of a publicity stunt? I had my answer when I spotted him aboard Zinnia leaving the Block Island Boat Basin some weeks later. The sun shining, the outboards purring, his hand again rested on the joystick, and there was a slight smile on his face. “Good for you, Bob,” I thought to myself as I watched the boat head out to Block Island Sound. 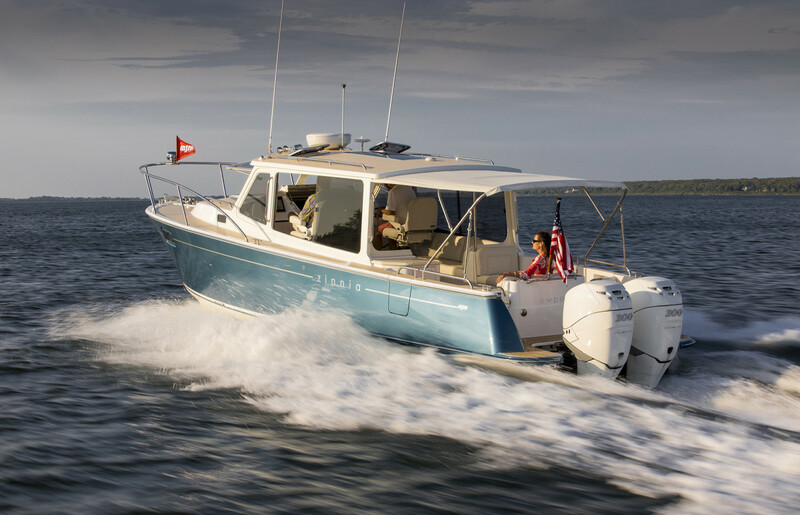 After my test of the 35z I thought about how the boat might indeed be a successful feeder platform to introduce new and younger boaters to the MJM lineup. But having watched Bob dock that boat, literally with one hand, and push off another dock on a sun-soaked summer afternoon, I realized the 35 will appeal to all boaters regardless of age. And that might just be the key to launching a boat that changes the game. TEST CONDITIONS: Air temperature: 78°F; seas: 2-4&apos;; wind: 15-20 knots. Speeds are two-way averages measured w/GPS. GPH taken via Mercury display. Range is 90% of advertised fuel capacity. Sound levels measured at the lower helm. 65 dB(A) is the level of normal conversation.